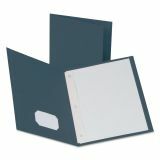 Oxford Twin-Pocket Folders with 3 Fasteners, 135-Sheet Capacity, Dark Blue, 25/Box - Back to school! Twin-pocket folders combine the benefits of a twin-pocket folder to hold loose documents plus built-in metal fasteners to prevent important papers from falling out. Three double-tang fasteners with stitched-in gussets bind up to 85 sheets of three-punched, letter-size paper. Generous pockets on inside front and back covers each hold 25 sheets. Inside front pocket has a convenient, business card holder so you can personalize your folder. 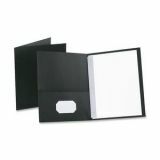 Folders are made of leatherette embossed paper.